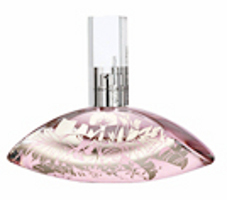 Calvin Klein will launch Euphoria Spring Temptation, a new limited edition flanker to 2005's Euphoria, this coming March. Euphoria Spring Temptation was developed by perfumers Carlos Benaim and Loc Dong, who also worked on the original Euphoria perfume. The fragrance notes include lush pear blossom, guava leaf, fluid waterfall accord, pink lily, dewy violet, white sandalwood, pure frosted musk and untouched amber. Eternity Summer for women 2009 is "the essence of romance and eternal beauty, caught in a fragrance", and features notes of litschi, pear blossom, ginger, mimosa, pink freesia, magnolia, musk, tonka bean and white cedar. Eternity Summer for women will be available in 100 ml Eau de Parfum. Eternity Summer for men 2009 ~ is "the essence of the eternal beauty of summer, caught in a new spicy-green fougere", and features notes of gin tonic cocktail, limone, bergamot, mountain air accord, pepper, basil, chamomile, white amber, hinoki wood and anise. It will be available in 100 ml Eau de Toilette. See also: Eternity Summer 2006, Eternity Summer 2007, Eternity Summer 2008. Other recent releases from Calvin Klein: Secret Obsession, CK One Summer 2009, CK One & CK Be "We are one". If the amber is untouched, how did they get it into the perfume? I swear, the names of synthetic notes and accords just keep getting stupider by the year. “Fluid waterfall accord.” “Dewy violet.” “Pure frosted musk.” Gah. LOL — well might you ask, Kemo Sabe. I often strip all those sorts of qualifiers in fragrance notes, but they were too good to resist in this one. Ack, but those aren't really “qualifiers”, are they? What are they? Well I have to admit these note descriptions definitely made me smile today and that's a good thing on this grey and oh so cold gloomy day! But just once wouldn't it be funny to see a list of notes that said something like this instead? – We made this perfume from some wet violets from last night's rain, musk oil that accidently was left in the freezer too long and some tap water to make it mix better. Well I guess not, it would take away all the romance but still! All you have to do is tweak the adjectives darker and you have a BPAL fragrance: arid pear blossom, guava leaf mold, muddy waterfall accord, sickly pink lily, dessicated violet, black sandalwood, sullied molten musk and violated amber. Violated amber — love it! LOL — yes, can't hurt! Ooooh! This sounds interesting! I can't wait to try it! OOH Gin Tonic Cocktail!? Interesting. I was just saying how I love the smell of Bombay Sapphire! Didn't Bombay do a gin fragrance a long time ago? I think they did. And Demeter, of course, has a Gin & Tonic scent, which smells startlingly like the real thing for maybe ten seconds, after which it just smells like lime cordial, though that, to be fair, is still a pretty nice thing to smell like. You took the words right of my mouth…untouched amber, Ha! I suppose marketing is just trying to snare customers with their almost magical descriptions of the notes-“Dewy violet”, well it's better than the alternative–dried- out violet. If the musk is pure, does that mean it is a virgin? or did they not touch that one either? On the bright side it could smell really pretty and a little different, I hope, I hope, I hope. Is *waterfall* a solar note? What do they call notes that are more to induce a *feeling* than an actual smell? And how do those fab magicians do it? Did they!?! I must find it. Yes! And then there's Apothia Velvet Rope for a martini. Just checked, it came out in 2003 & was called Infusion by Bombay Sapphire. Don't know if it's still around. I liked last year's Eternity better, but these are pretty. I've e-mailed the Bombay Sapphire people to find out! I'll probably sniff it too if I see it! Wouldn't it be nice (to quote the Beach Boys) to just hear a fragrance described as such…. A Beautiful Floral-Chypre Fragrance consisiting of Osmanthus, Peony, Frangipani, Tahitian Vanilla Orchid, Pink Pamplemousse, Vetiver Haitian, Sandalwood, Plumeria, Oakmoss, Sagemoss, Cumin, and Lily of the Valley…. wouldn't that be sufficient to describe a beautiful fragrance? what is with all these comical descriptions??? trying to be “EVOCATIVE” I imagine, Just seems silly! Seems silly to me too, but guessing some customers must like it?